Surrey has 52 libraries, and over 12500 audio books. Surrey also had a big problem... until Mantra Lingua stepped in. Elderly, blind, or visually-impaired people found it very difficult to read text on the spine of the packaging. The text was too small. And it had to be read running upwards! It would be far better, they thought, to give the user the equvalent of a PENfriend. Then all they would need to do was touch the label on the spine to listen to four things: the title, the author, the name of the narrator, and importantly, the 'blurb'. With so many titles, the blurb is a key factor in choosing an audio book. Mantra Lingua has been working with Surrey for over a year, and very soon in December they will be launching this service. Click on the picture below to see a short video of the service. If you are from another council, please inform your library of the Surrey Service so they can contact us. Interlibrary movement of audiobooks was a big challenge. Mantra Lingua overcame this with a clever procedure that is simple to operate and learn. Nottingham Libraries has also taken the "Audio Find Books" system. This is what they said, " We have been using the RNIB Penfriend in Nottingham City Libraries for about 5 years now with our Talking Books for adults on CD and MP3 at Nottingham Central Library and two of our larger libraries. It has been a great help to visually impaired people in allowing them to make selections from the library shelves independently. It was great to find out about the Mantra Lingua "Audio Find Book" system that goes with Penfriend 2 as this has made it quicker and easier to add recordings onto the Penfriend and to manage the records. We have been able to extend the service to our new library at Hyson Green where we have installed a range of equipment to make our stock accessible to people with sight loss. 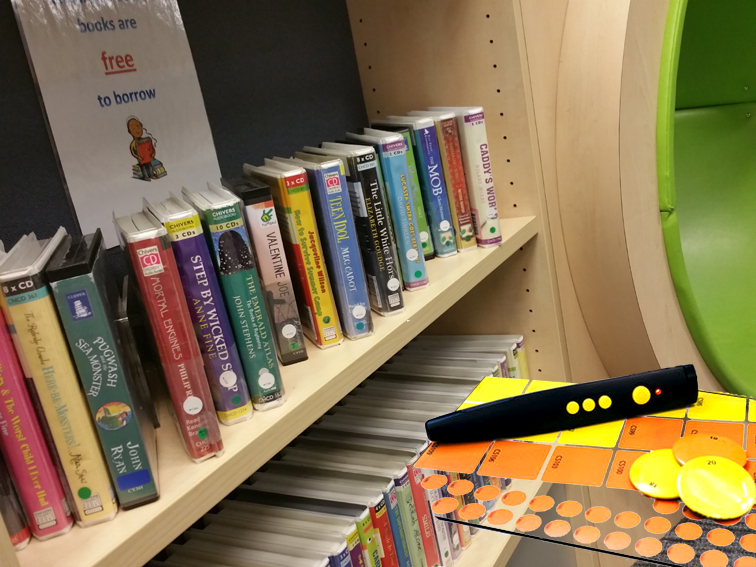 We particularly like the Penpal which we are using to share stories in the library and which can be used by parents or children who are visually impaired. It is great that it can support our dual language stock as well, with recordings in other languages." Over the past five years we have partnered with the RNIB (Royal National Institution for the Blind) UK, in supplying PENfriends. These use the same technology as PENpal but are designed primarily for individuals as a labelling tool. PENfriend2 was launched at the end of 2014. This pen is a substantial upgrade on the original PENfriend, and can be ordered exclusively through the RNIB website. To see how PENfriend works please watch this video. (Please note that this very popular video, with 42000 viewers, demonstrates the first version of PENfriend, v1, which has been replaced with PENfriend 2). There are a number of accessories that come free for you to better manage and protect your recordings. There are 100+ recordable labels (each label can record up to 1 hour). There are 3 magnetic discs, which serve as prompts for your PENfriend recordings, which can be attached to your food containers or fridge. There is also a safety clip lanyard. These are all packed in a reusable plastic sandwich box! In addition, there are over 1000 unique labels that you can buy, and laundry labels that finger-press to your clothes and can withstand conditions in washing machines and dryers. All our books are designed for blind and partially sighted people, but you can also order tactile print books which are sound-enabled. The viVOS ARtframe is perfect for audio communications with Braille or swell paper. 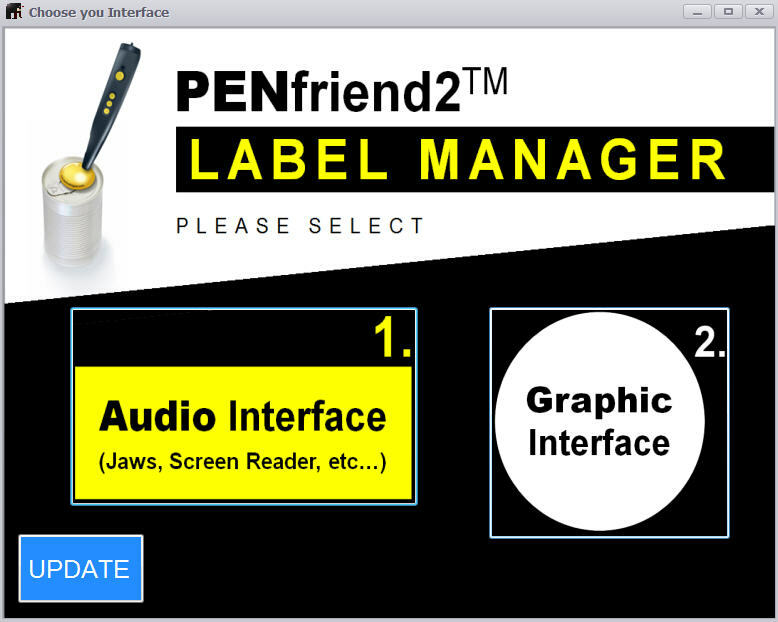 Penfriend2 comes with a free label manager that can be downloaded below. This has two interfaces: quick backup and restore Audio Interface 1, which we recommend using most of the time. The Graphic Interface 2 is for more advanced users who wish to micro-control the allocation of audio files to their stickers. We recommend the aid of a sighted person if you use Graphic Interface 2 since it is not 'Jaws' supported. (PENpal users: please note that Label Manager does not work with PENpal since the file allocation structure is very different). If you click "Audio Interface 1" you are taken to a simple screen which will automatically backup your audio recordings with their label allocation. To restore, just connect your PENfriend to the computer with a USB cable and press the restore button. All your recordings will be updated on the pen. The Add Files option allows you to transfer music or narrations in .mp3 format to specific label numbers defined by the label sets you purchased: D1, S2, or A3. Similarly, Delete files allows you to delete any recordings allocated to a label. 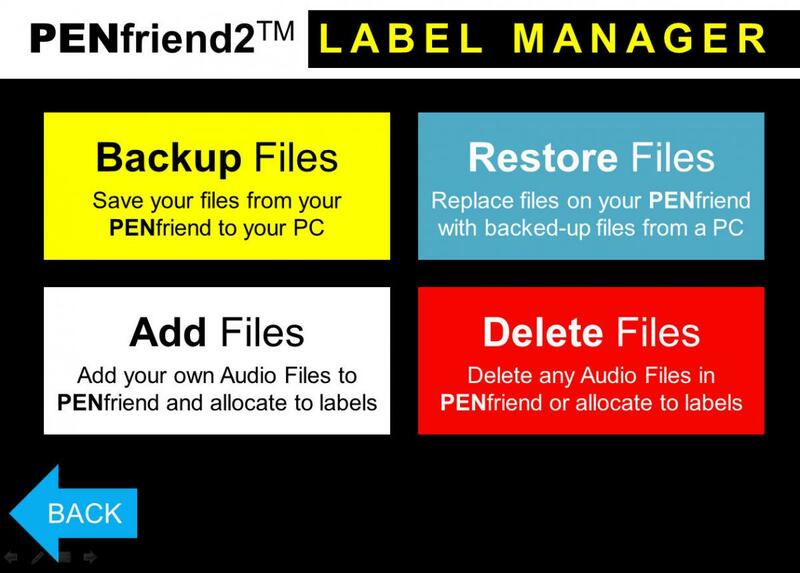 Are you replacing PENfriend with PENfriend2? Click on the "Download" button below and the "PENfriend Tool Transfer Wizard" programme will be downloaded to the Desktop of your Windows based computer. Double-click on the "PENfriend Tool Transfer Wizard" and save the programme to your hard disk. Double-click on the setup.exe file to install the Wizard to the hard disk of your Windows based computer. Run the programme by double-clicking the "PENfriend Transfer Wizard" icon on your desktop. Then connect the old PENfriend with the USB cable and follow the instructions. Please see the video below. Once the transfer is finished (typically in about 5 minutes) you can still use you old PENfriend as well as PENfriend2. You can use any of the books and posters on this website on your PENfriend2. There are over 1000 titles to choose from, mainly in the children's area. Use PENfriend to share books with your children. To play back sound from any book, ensure that you are in audio book mode on Penfriend2 (blue light). Why not try the birdsongs series flip books on Garden Birds, Countryside Birds, and Wetland Birds? They are only £3.50 each and you can listen to the bird calls. There is still time, but you must be quick, to buy our new picture book by award winning illustrator, Fiona Rose, "A Day with Grandpa". Watch this page periodically for special offers open only to PENfriend users.